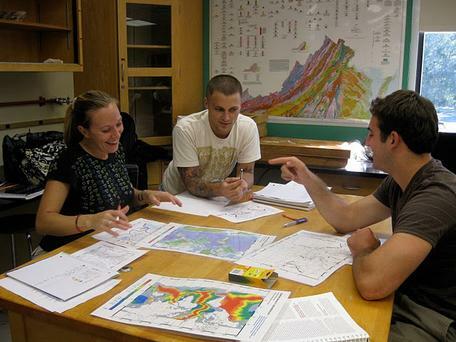 This website provides faculty and students with information about geoscience education at two-year colleges. Faculty can learn about teaching materials, find information about workforce development and geoscience careers, and learn about professional development opportunities. Students can find out about scholarships and educational opportunities. Materials that are directly applicable to teaching at two-year colleges have been developed by participants in various projects. This page organizes these materials around several important and relevant themes: Teaching Introductory Courses, Mathematics Preparation, Teaching in the Field, Undergraduate Research, Ready-to-go Lessons and Activities, and Perspectives. There are no current announcements at this time. You can also check the News at NAGT and Teach the Earth. The SAGE 2YC project has begun working on ways to help students at two-year colleges be successful in the geoscience workforce as well as providing them with information on the kinds of opportunities that are out there for people with geoscience degrees. Those interested in learning more about teaching at a two-year college can read career profiles of faculty at two-year colleges and and find out more about the faculty job search process and interviews at community colleges. Also, not only can two-year colleges prepare students for work in industry, they can also be the first step along the path for teaching at two-year colleges or four-year colleges or universities. As information for workshops, events, and programs associated with this project becomes available, we will post it here. Be sure to check out the Announcements to the right for opportunities and events from other sources. These workshops and other events offer great opportunities to meet and network with fellow two-year college faculty and can help decrease the sense of isolation that is common among many 2YC faculty teaching geoscience. This website includes resources from a number of sources. Learn more about these contributing projects and the work they have all engaged in. If you have questions or want to discuss aspects of teaching geoscience at two-year colleges, you can make use of the Discussion Board. Post a thread or respond to someone else's and generate a conversation about the issues facing 2YC education. There is also an email list for this effort where members can get announcements and discuss issues surrounding geoscience education at two-year colleges. Just sign up and you'll be better connected to the Geo2YC community. National Science Foundation Geosciences Directorate (GEO 0939671) and the National Association of Geoscience Teachers (consider becoming a member).